When you think of low back pain, there most likely are some key factors that stick out to you like lifting with your back and not your legs. Also, if you’re not exercising properly and putting a lot of added and unwanted weight on your lower back. 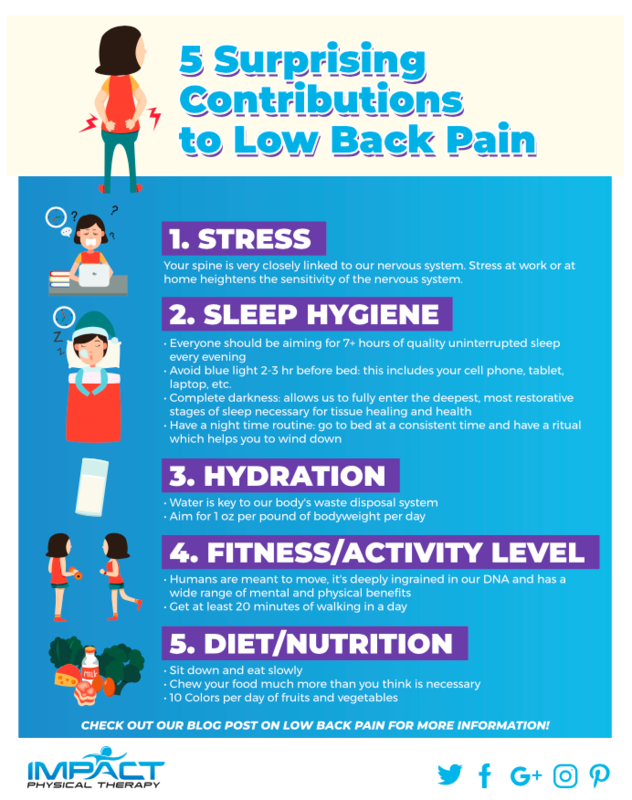 Did you know that there are a whole host of contributing factors that can lead to low back pain that you might not have ever thought about? Well, now you will. While your muscles, joints, and nerves themselves have a big impact on the pain you feel, other factors can contribute just as much to your pain. While it is paramount to restore normal function to your body and how it moves, it is just as important to ensure other aspects of your life are healthy to give your body what it needs to heal. Here are some surprising causes of low back pain that you can help prevent by being aware. Have you ever had a car alarm go off on you when you just walked by the car without even touching it? That is your nervous system under stress! A stressed-out nervous system will send a pain signal to your brain under even the smallest and least harmful stimulus. A person’s stress level at work and home is a big factor in why two people can have the same anatomical pathology (i.e. herniated disc or low back arthritis) yet have completely different levels of pain and disability. At Impact PT, we want to hear about your whole live – not just your back/body. We also want to be sure you find strategies to manage your stress (talking to someone, exercising, taking time in nature, etc.) to allow you to take back control of your life. Everyone is looking for the next cutting-edge recovery gizmo, tactic, or idea. However, we often overlook the simplest and single most powerful recovery tool in our arsenal, our own bed. Everyone should be aiming for 7+ hours of quality uninterrupted sleep every evening. Sleep hygiene refers to some habits that can help improve the quality of your sleep. Avoid Blue Light – Try not to utilize a cell phone, tablet, laptop or other electronic devices for 2-3 hours before bed and no cell phones in the bedroom, according to research by the University of Toronto and Harvard Health. Exposure of blue light can increase Cortisol, this wakes you up and decreases melatonin, which puts you to sleep. Complete Darkness – Invest in some blackout curtains and sleep in a cool pitch black room. Again this speaks to our body’s natural bio-rhythms and allows us to fully enter the deepest, most restorative stages of sleep necessary for tissue healing and health. Have a Night Time Routine: Go to bed at a consistent time and have a ritual which helps you to wind down. This could be some diaphragmatic breathing, reading a book to your kids, anything non-stimulatory. Routine and rhythm are something inherent to us as a species. Most of us have heard the fact that the human being is 75% water. Beyond that water is key to our body’s waste disposal system. Our body has several mechanisms for eliminating toxins including the liver, kidney, skin, and lungs. All of which require proper hydration to function optimally. So the process of improving tissue health and restoring activity requires these systems firing on all cylinders. Aim for 1 oz per pound of bodyweight per day of water. Other beverages do not count in your total so drink up! Humans are meant to move, it’s deeply ingrained in our DNA and has a wide range of mental and physical benefits. Now how much and how intense you move is highly specific to the individual. At Impact PT, we understand how difficult it can be to get back to an active lifestyle after a back injury. Start with a small amount of activity that you know you can accomplish (like walking 5 minutes/day) and increase your activity a few minutes each day. Here are some exercises and stretches designed specifically to help with your low back pain. Ask your physical therapists in Glendale and Scottsdale for more tips on how to return to pain-free activity! Let us evaluate your movement program and tailor volume and intensity specific to your injury state. Nothing can beat a 20-minute walk in the sunshine, blood flow and vitamin D are two of nature’s powerhouses for regulation and regeneration. Try to take a no cell phone walk every day! Everything you put in your body can have a positive or negative effect on your healing. Nutrition is definitely not a one size fits all prescription so we will give some basic principles to improve your food experience and nutrient absorption of nutrients. Chew – The first step to digestion starts in your mouth. Chew your food much more than you think is necessary and it has wide-ranging benefits. Proteins are more readily absorbed since they get more fully broken down mechanically and your body can process them better later in the digestive tract. Your body will produce more saliva if you chew slowly. This is positive as saliva contains specific enzymes needed to digest carbohydrates. 10 colors – Aim for 10 colors per day of fruits and vegetables. Various colors mean a varying window of vitamins and minerals. This means that we are getting a wide variety of nutrient-dense foods. You will provide your body the pieces needed for health and also it will help with the feeling of fullness.